When I'm in a healing session I am always careful to clear, balance and heal my client without taking on any of their baggage. People come through our doors with lots of stuff to clear, from headaches to anxieties to spirit attachments to just about anything else. I will always ground and protect myself before a session, and I am also very much attuned to healing energy which flows through me into the client. There isn't much energy going in the other direction. Today I had a major realisation. I need to do the same grounding and protecting in my everyday life! Or to be more accurate, I need to be more aware of my energy levels and my interactions in my day to day life. There have been two cases recently where I was speaking with a friend who is anxious about a particular topic, and in trying to reassure them I take their anxiety and claim is as my own. Subconsciously of course! The 1st time this happened, a colleague was telling me that she doesn't do light weight training at the gym because she's scared of hurting her back and doing permanent damage. I remember thinking that was ridiculous! Our bodies are very resistant, there is nothing wrong with her from a medical POV (she has seen doctors). If our bones can heal from an actual break, how likely is it that we will throw our back out permanently by doing crunches? I personally think most back pain is psycho-somatic, there are a couple really good books out there that talk about how our stress, our thoughts and our worries will trigger chronic pain. The book I'm reading now is called "Why People Get Sick: The Mind-Body Connection". One of the things they talk about is how you might have 10 people with a spinal abnormality but only 5 of them have pain. The authors view is that people with pain actually triggered it somatically, which leads the doctor to order an x-ray that finds a cause in the spinal abnormality. I'm not going to go so far as to say that every case of back pain is psycho-somatic, but mine certainly was. I used a self-healing technique called Knowledge Therapy to condition my body NOT to mask stress and emotional challenges with chronic pain (the theory is that our subconscious mind creates this pain, to distract us from something in our life that would be difficult to face head-on). Please Google Dr John Sarno if you would like to read more about it. WHAT A HUGE RELIEF THAT HAS BEEN! So with all this in mind, I was using my rational mind and arguments to reassure my friend and colleague. Her back was strong, she is young, she had once isolated incident and why would that recur? Our bodies can heal themselves. The rational arguments made no headway, and I started to sense an underlying anxiety and fear. Irrational fear and anxiety. Unfounded fear. But fear that was still very real. What did I do? Have no idea how it happened but I took it off her energetically, and made it mine! The very next night I went to the gym and pulled a little muscle in my neck doing the silliest thing. Really! I need to be more careful. 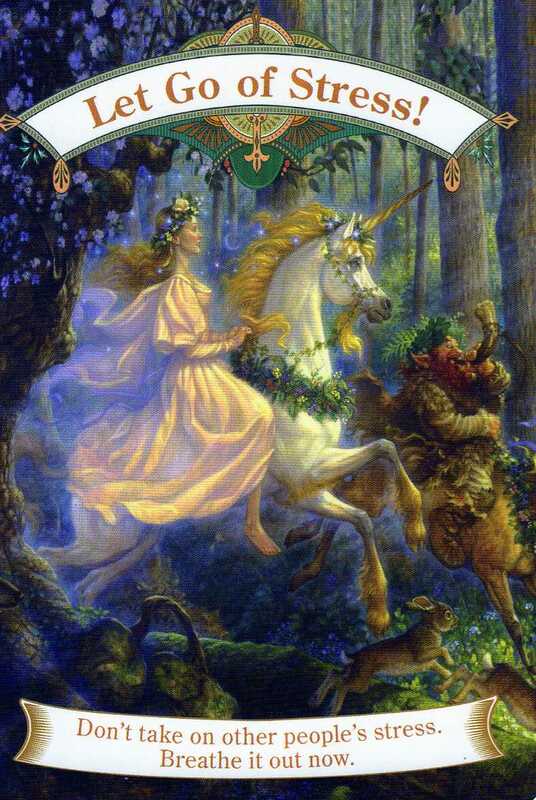 The unicorn card I've chosen tells us to let go of stress, and if you read the booklet it also tells us that we've been feeling other people's stress and emotions. It encourages us to stop doing this asap. This is the 2nd time I take someone's fear or anxiety off them, leaving them really cool, calm and collected. Can't say the same for myself. The good thing is I've learned my lesson and I won't be doing it again. When I was a kid my mom used to tell me not to rescue other kids - my brother and I were the kind who always stood up for the underdog and befriended them. At the time I thought her advice was a little bit selfish and wrong. There is a lot to be said for being nice to the outsiders, but taking on this "I want to help you" role is completely out of place. People have to learn to fend for themselves, and as healers we can only help to a certain point. The rest is their lesson to learn, and we're not doing them any favours if we just lift it off them. Am I being too harsh? I don't think so! Let's see if I can follow my own advice, ask me about it in a couple weeks. Brilliant post Geena. I have had a lot of stress after moving over ten hours away from home for the first time in my life and having to fend for myself so to speak. I held all of the stress inwards, didn't let it show and one day I just started crying. I felt so much lighter after that. It's good to remember not to hold things in. I also live with an very emotionally unstable person and will take on his panic attacks if I am even in the same room as him while his is occurring. My sleep patterns will match his. Goodness being a healer must be exhausting sometimes. Glad you are okay and learned your lesson so quickly. These cards are just divine and your posts are truly informative.